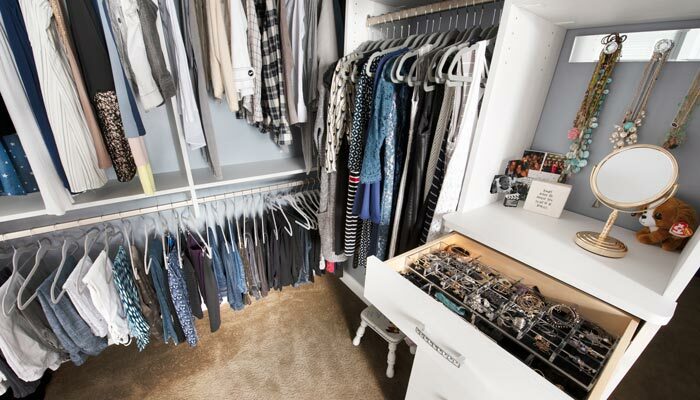 The addition of a wall to split the original master closet in two created the opportunity for Closet Works to design her very own dream walk-in closet dressing room. 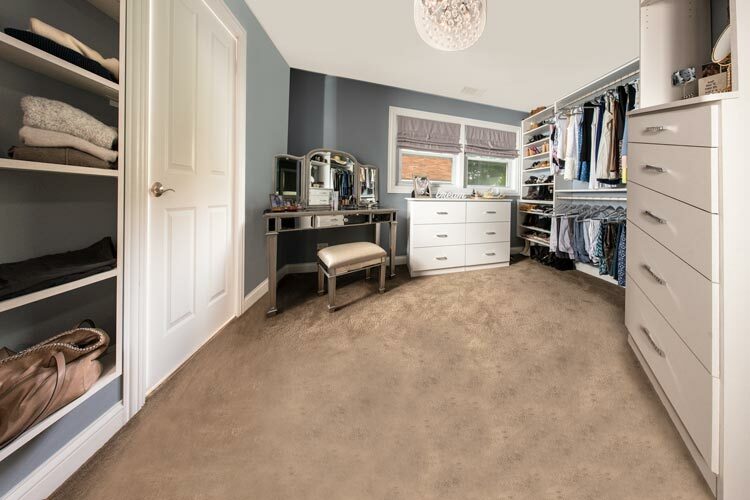 The original floorplan of this husband and wife's bedroom provided one master closet that wasn't what either had envisioned as their ideal closet. 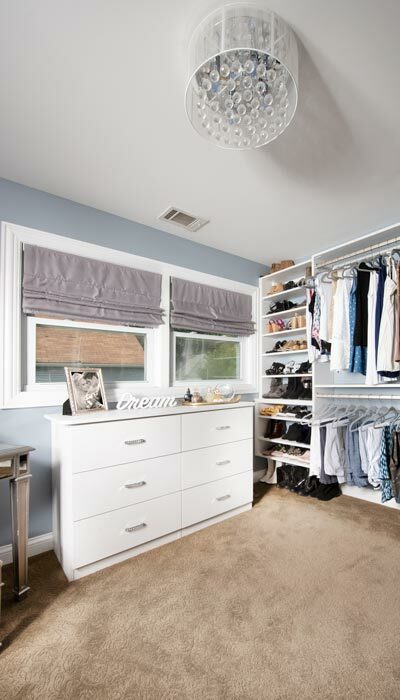 Each having specific wardrobe storage needs and aesthetic preferences, the default layout was in need of renovation to accommodate the pair. 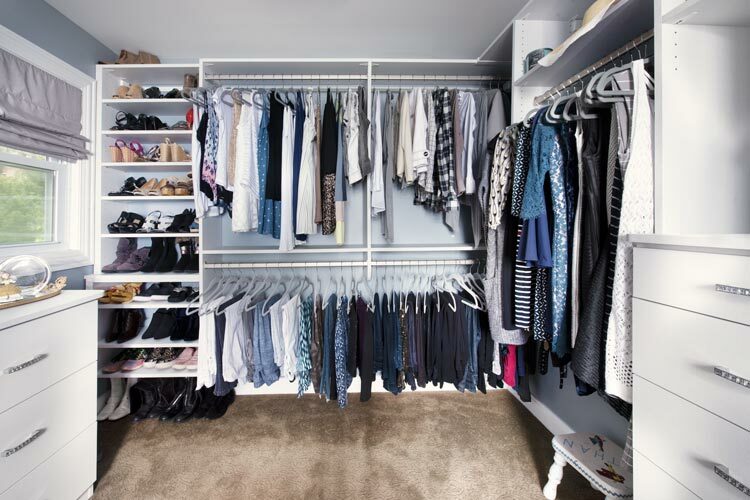 After building a wall to divide the space in two, her side was ready to be transformed into the closet of her dreams. The client had a custom vanity that she wanted to be a focal point, therefore choosing a neutral laminate was the obvious choice. 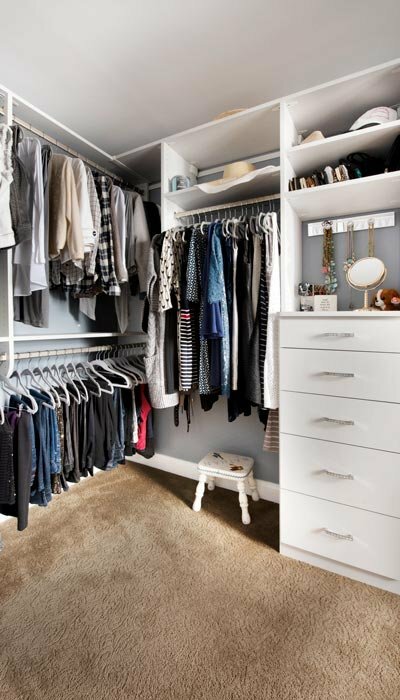 The not-so-obvious detail about the color choice though, is that it's our Canvas laminate. 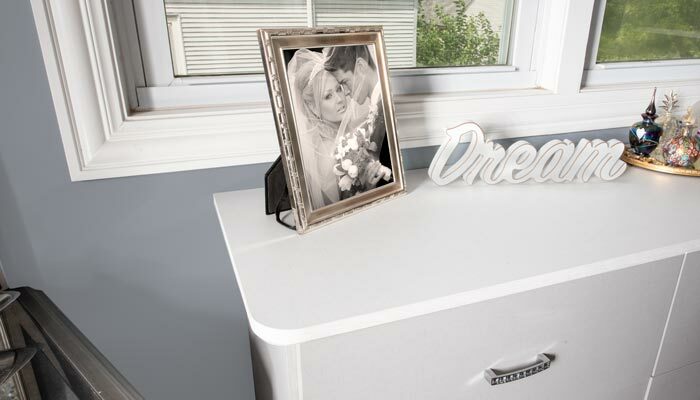 Take a closer look and you'll see that Canvas offers a subtle, textural graining strikingly similar to an artist's canvas — becoming a unique choice and alternative to standard white. 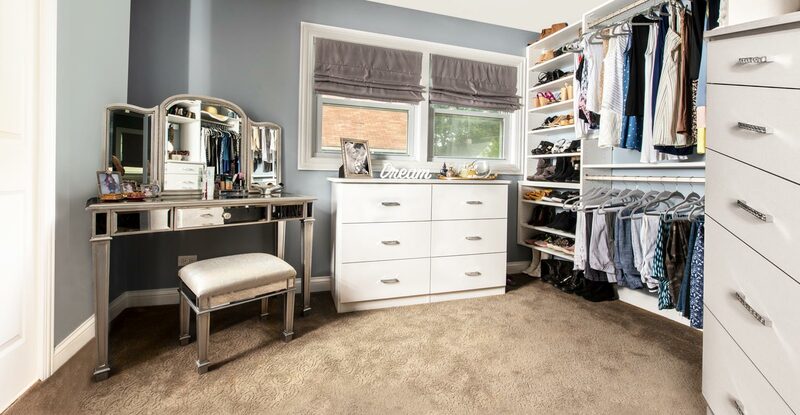 The decision to use Canvas played well with the variety of surface textures and colors in the room including the showcased mirror vanity, decorative light fixture, rhinestone hardware, and muted, cool colors. In order to accommodate the depth of the window trim, a filler panel is used for the most proper fit between the wall and trim. 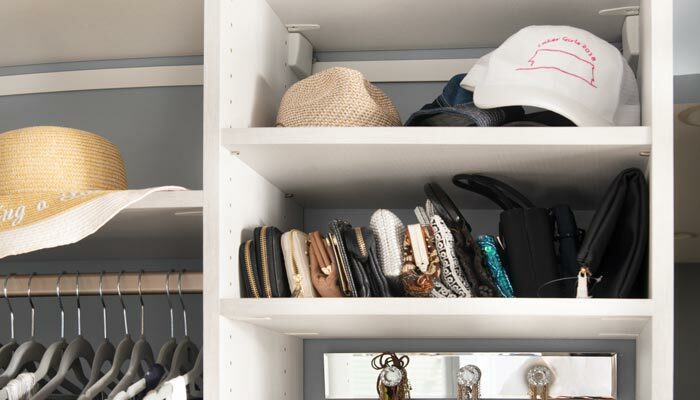 The space below the window allowed the depth of the shelves to increase to 14 inches in comparison to the 10 inch deep shelves along the trim. 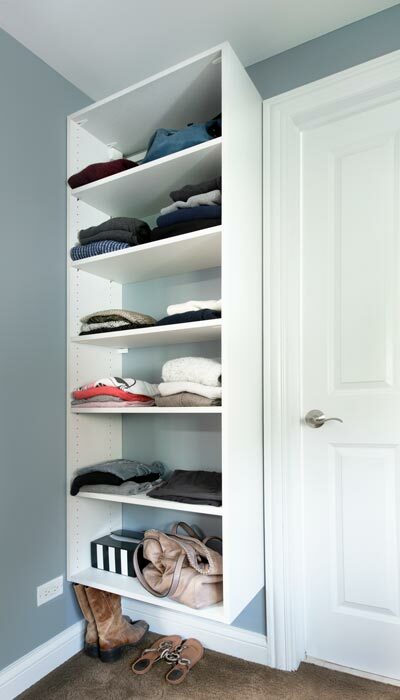 This design sets a great example how Closet Works can work around the construction details of your home and integrate custom-sized panels into your design.